The last few days in the Holy Trinity Monastery have been one of preparation and the celebration of our Lord’s Holy Nativity. One the seminarians finished with their exams for the fall semester, they began to help the monastery brethren in the thorough cleaning of all of the monastery and seminary buildings, especially the church. This coincided with the Forefeast of the Nativity, which was the liturgical preparation. This all culminated in the Eve of the Nativity. As is customary in the monastery, all those who inhabit the monastery, monks, workers, seminarians, everyone, prepares for receiving the Holy Mysteries by confessing and communing if possible, both on the Eve and on the day itself of the Nativity. Since this year, Holy Nativity fell on a Sunday, the Royal Hours were served on Friday morning. On Saturday morning, Divine Liturgy was held at 9AM, followed immediately by the Divine Liturgy of St. John Chrysostom. Despite the arctic freeze, many pilgrims found their way to the monastery to join in with the community and our neighbors. At the end of Great Vespers, the icon of the Nativity, preceded by a candle, was carried to the middle of the church, whereupon the choir sang the troparion and the kontakion of the feast. On Saturday evening, according to tradition, at 5PM, when the first star came out, the community sat down to a special evening meal, the only one of the day. All the monastics wore their formal attire. Gifts from the abbot were handed out to all the brethren. Part of the brotherhood are now our two new novices, Brothers Benjamin and Dragan. Br. Dragan’s parents joined us for the feast. At 7PM, the All-Night Vigil commenced, consisting of Great Compline, Litia and Matins. The singing was done antiphonally, and the many special melodies and chants were sung with the utmost care and feeling, lending to the very prayerful atmosphere. The community was joined by pilgrims from all over the Northeast and also Canada, California and other parts. 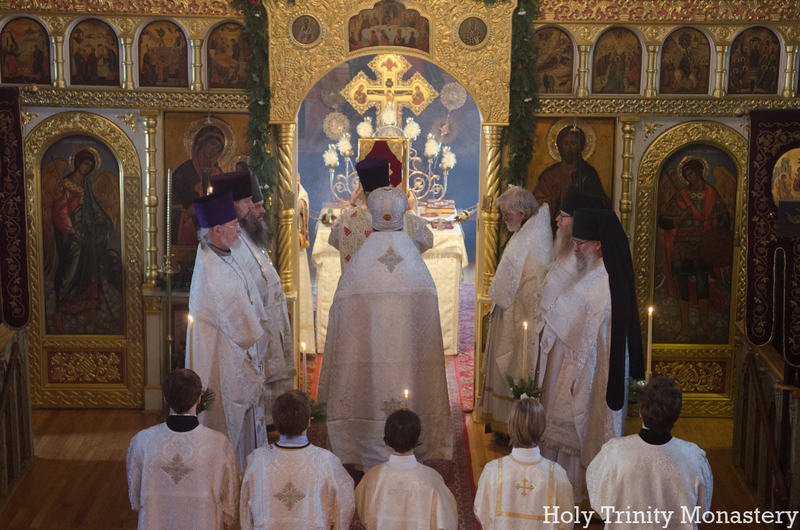 The Divine Liturgy began at 9AM on Sunday morning. The church was packed, and the faithful communed from three chalices. Afterwards, there was a festive meal in the monastery refectory with the traditional fish holodets. As has been the custom, a reception was offered in the office of the abbot, Archimandrite Luke, upon completion of the meal, thus giving everyone the opportunity to further participate joyfully in the feast. Carols were sung, both Russian and American. In the evening, vespers and matins were served and on Monday, the Second day of Nativity, the Synaxis of the Most Holy Theotokos, Liturgy was served at 9AM. Such was the schedule for Tuesday, the Third Day of Nativity, the big difference being that we had the joy of having one of our bishops joining us for the feast, His Grace, Bishop Nicholas of Manhattan. To the special joy of all, a former seminarian of ours, subsequently a deacon, Sergey Kosov, was ordained to the priesthood, and our choir director, also a recent graduate of the seminar, and now our public relations director, Nikolai Kotar, was ordained to the diaconate. We wish them God’s help in their future service to the Church. A special thanks to our pilgrim, Ekaterina, who spent many hours preparing the decorations for the church, the trapeza, and the wreaths and bouquets, placed all over the monastery, thus lending even more to the spirit of the feast days. In this she was aided by two Alexandra and Elisabeth, daughters of our neighbors, Vladimir and Svetlana. 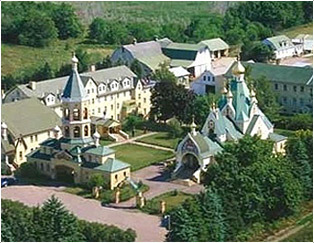 Vladyka Nikolai, during his visit to the monastery bequeathed a beautiful shroud of the Falling Asleep of the Most Holy Theotokos. The shroud was made in the famous Kiev Caves Monastery, the birthplace of Russian Orthodox monasticism. It is Vladyka’s wish that this shroud adorn the monastery and be used during the monastery’s celebration of the feast of the Dormition of the Mother of God. Back in the late 1970’s and early 1980’s the monastery did serve the burial service of the Mother of God. This was served in English. Upon the conclusion of the Vigil on the feast of the Dormition, those participating, processed up to the Dormition Church in the monastery’s cemetery and with the blessing of the ever-memorable Metropolitan Laurus, served the Vigil in English, concluding with the burial service, the end of which consisted in a procession around the cemetery. This service in many ways emulates the burial service of the Lord. In Russia, this service was observed in different ways, depending on the place. In some places, it was served three days after the Dormition, in others on the day itself, or even before the feast. It is our abbot’s wish that we renew this observation as a part of our celebration of the Dormition, which in general is served with great reverence and solemnity in the monastery. For this reason, we are very grateful to our dear Vladyka Nicholas for his great care and kindness towards his alma mater.